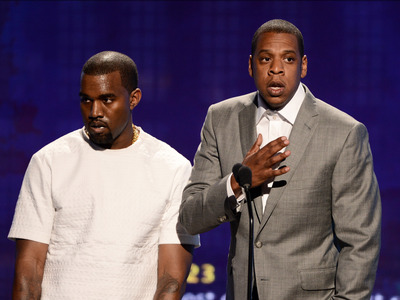 Michael Buckner/GettyKanye West and Jay Z.
Kanye West, who earlier this year called out Apple and Tidal’s streaming rivalry for “f—ing up the music game,” has again spoken out against the two services, Pitchfork reports. At a concert in Seattle on Wednesday night, West reportedly said that the possibility of releasing a sequel to 2011’s “Watch the Throne” — his critically acclaimed collaborative album with Jay Z — has in some way been prevented by Jay Z’s ownership of Tidal and its streaming conflicts with Apple Music. In July, West urged Apple CEO Tim Cook to “stop trying to act like [he’s] Steve [Jobs]” and instead write a check to Jay Z to acquire Tidal. Apple has since denied rumours that it will purchase Tidal or any other streaming service. Meanwhile, West confirmed in September that he’s working on a new collaborative album with Drake, Apple Music’s poster child.